Very few people can get away with literally no pants at all. Cammila... is one of those people who can. Cute! There's definitely a 90's vibe with the slightly clunky shoes + black tank & shoes + floral + oversized shirt. I like it. I loooove those pants lady! Love this outfit, and your house. Even the garage is beautiful! 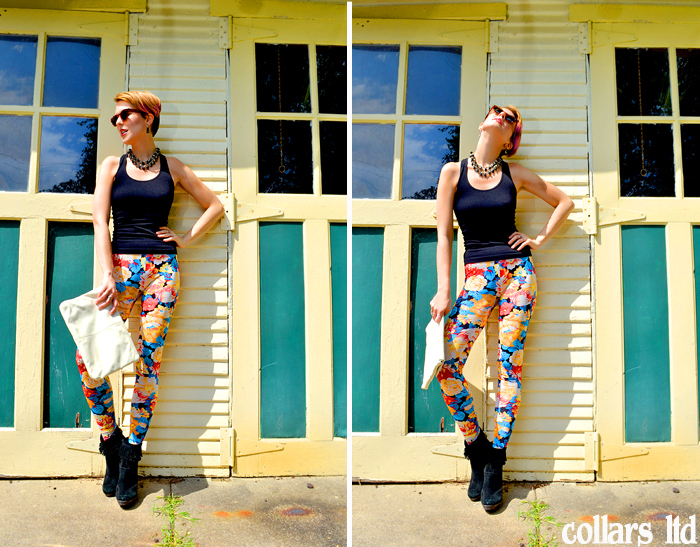 I love how crazy these leggings are! SOOO much color! pfft. those ARE pants, sillies! and they are awesome pants. as long as one's lady parts aren't visible, I'm in the leggings are pants club. I do ridiculous acrobatics in the mirror to make sure my pant/leggings stay opaque in every possible stretch situation!